Yes! Though we provide food and monitor your pets eating habits while they are with us, we would be glad to feed them the food you bring. All food brought by pet owners should preferrably be in a plastic or metal container. No problem! We pride ourselves on individual attention. Can our pet bring toys? snacks? bedding? Yes! We encourage you to do so. Familiar toys and easy wash bedding from home, make the transition easier and more comfortable. What if my pet is in cycle (heat)? We will not accept any pet that is in cycle (heat). Also, if your pet comes into cycle (heat) while boarded, your pet must be checked-out. Do I need to vaccinate my pet? Yes. For the protection of your pet and to keep our Lodge safe and clean, we require all dogs to have current proof of rabies, distemper, parvo and bordetella. For cats we need proof of rabies, distemper and feline leukemia. Can we see the accommodations? Of course! We are very proud of our facility and its cleanliness. You are welcome to drop by anytime during business hours. 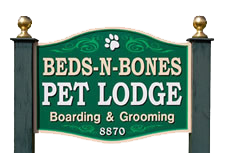 © 2019 BEDS-N-BONES PET LODGE. Designed by Millenium Computers. All Rights Reserved.